I ate at Maydan three times this week. That’s not the crazy part. Since I started blogging, I’ve often eaten at restaurants twice so I could try different dishes. Three times in a week is unusual, but it doesn’t feel all that different than eating somewhere twice. What does feel different — and this is the crazy part — is how I felt on the nights I didn’t eat at Maydan. I found myself kind of missing it. That’s a feeling I’ve never had before, certainly not about a place I’d just eaten at three nights in a row. I’m usually like the Washington Capitols in the playoffs — one and done. I eat somewhere and it goes to the back of the line behind all the other restaurants in my rotation and all the new ones I need to check out. So how could I still feel Maydan’s pull after three straight nights? I’ve done a lot of thinking about this (yes, I need more hobbies, why do you ask?) and the best answer I can come up with is that Maydan pulls off a rare trifecta. It hires warm and welcoming people. It puts them in a space that feels transportive and special. And it serves terrific food. So many restaurants hit on one or two of these cylinders. Very few hit on all three. That’s not to say that all those factors get equal weight. Clearly food is the most important. 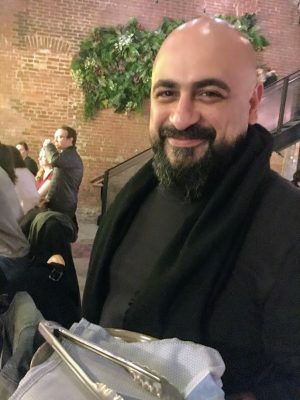 I’d happily eat in a place with great food even if I have to sit on the floor — or stand in line to eat at a cramped counter a la Bad Saint — but the most magical restaurants are the ones, like Maydan, that score high across the board. Because that’s when the alchemy kicks in. It becomes not just about the food — I can’t believe those words just came out of my mouth — but something much bigger. It becomes about community. Fifty years ago, that feeling of being welcomed, well-fed and cared for would have been called hospitality. But that word has been rendered bloodless by the corporate “hospitality industry” and schools of “hospitality management.” Community is a more modern, fitting word. 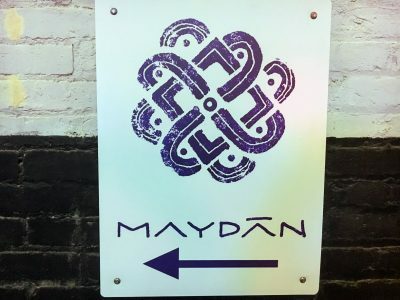 Not to get too dramatic, but Maydan creates a sense of connection and well-being that satisfies some deep social yearnings. At least it does for me. That’s what makes me want to go back, no matter how often I eat there. Let me take you there. Maybe it’ll speak to you, too. Let’s start with the place itself. 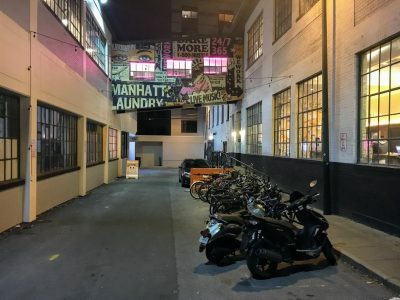 It’s at the end of an alley, not looking to draw attention to itself. There’s no curb appeal because there’s no curb. No tourists are stumbling in off the street and asking to see a menu. Everyone who’s there is there because they sought it out. You can call that exclusive. I call it self-selected. The address says Florida Avenue but it’s really at the end of this alley off Florida between 13th and 14th Streets. Look for the La Colombe coffee shop and you’ll see the alley. Maydan is at the far end on the right. Maydan’s front entrance. In the movies, you’d never open this door without calling for back-up. But the nondescript exterior only adds to the Willy Wonka effect when you walk through the door. 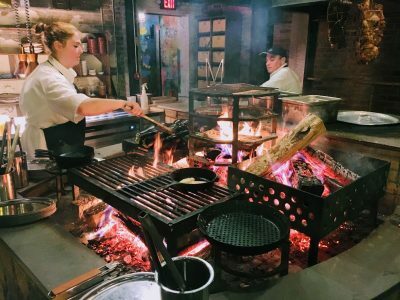 When you step into the restaurant, the first thing you see is the huge open hearth. 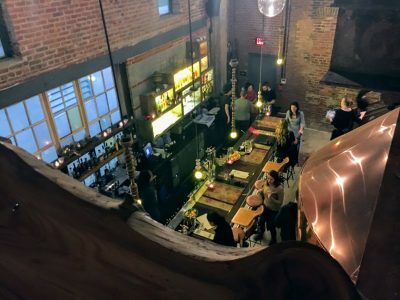 Then you see the bar, the brick and the stairs leading to the second floor dining area and you think to yourself this is the coolest space in town. View of the bar from the second floor. The open hearth is under the copper hooding. The entire floor plan was built from scratch out of a plain brick box that used to be part of the Manhattan Laundry. 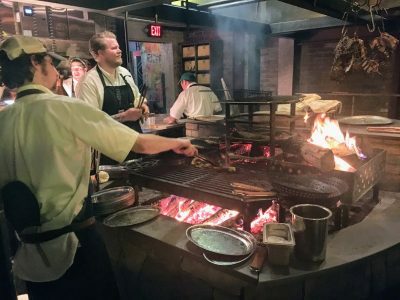 Like The Dabney, most of the cooking at Maydan happens over or in the wood fire. Unlike The Dabney, Maydan’s fire pit is right in the center of the room. You’re literally sitting around the fire. That’s about as elemental as it gets. The smell of smoke and the sight of food cooking over an open flame tells your caveperson brain there’s food and safety here. And maybe, if the hunt that day was particularly successful, s’mores. While the space is spectacular, the people at Maydan are more so. I have no idea how they found such a unfailingly friendly and committed group. I keep reading press stories about how the DC restaurant glut is making it impossible to find good workers. Someone needs to tell that to Maydan because they didn’t get the memo. 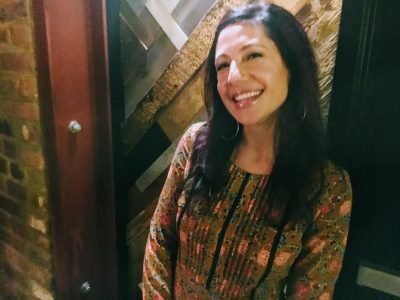 This is Maydan owner Rose Previte. You may know her from her first restaurant, Compass Rose. Or you may know her as the host of the WETA restaurant review show, Check, Please! The first time I saw her in person she was carrying a whole chicken to my table at Maydan. She smiled and said “Hello, friends. I have a chicken for you.” The second night she was manning the hostess stand and welcomed me back the instant I walked through the door. The third night she worried about whether the food I ordered to go would travel well. I felt guilty about not getting back to her, so, Rose, if you’re reading this, it was delicious. This is GM Said Haddad. If you were starting a restaurant, Said would be your #1 draft choice. He clearly loves his job and engaging with people. On night #1, I was waiting for my wife and son to arrive in the front entryway where Said was checking people in. I had no idea he was the general manager. When there was a lull, I asked Said what he liked on the menu. I thought I’d get one or two suggestions and then he’d go back to his real work. 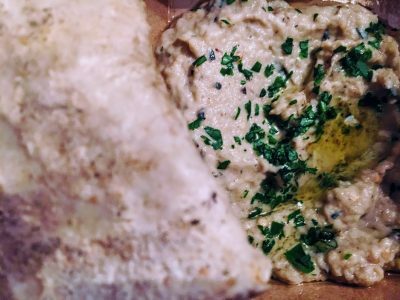 Instead, for the next ten minutes we went through the whole menu and a small chunk of his life story (he’s Lebanese-Palestinian and the first thing he recommended was the chicken, which he said reminded him of home). On nights #2 and #3, I got the warmest welcome since Jon Snow reunited with Sansa. 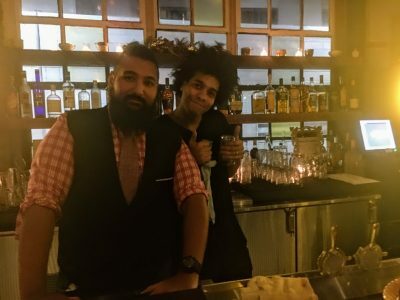 This is Chris and Drew, two of the barkeeps. I ate at the bar on night #2. I hate eating at bars. The chairs tend to be uncomfortable and there’s a decided lack of personal space. Plus, I’m not much of a drinker, so there goes the obvious small talk with the bartender. But I loved hanging with these guys. They were friendly but not obtrusive. On night #3, they acted like I was Ed McMahon showing up on their front porch (neither one of them is old enough to get that reference). I was just as happy to see them. The food is rooted in the Middle East and North Africa. 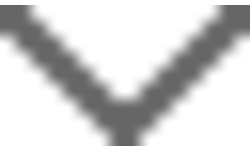 These are dishes that the people of those regions would recognize, even if the Maydan versions are unique. Cooking over the wood fire ensures that most dishes have the added element of smoke. It can be limiting but only in the sense that good barbecue or wood-fired pizza can be limiting — i.e., not at all. Working directly with fire also adds rusticity and a lack of fussiness to the proceedings. There are no tweezers in the kitchen here, thank the Lord. The style of service matches the culinary vibe. It’s all about abundance and sharing. Our waitress on night #1 told us the goal was to have the table filled with food. She didn’t have to ask twice. There is one nod to modernity on the menu. Call it personalization. We live in a world in which everyone has their own specific Starbucks order and their own playlist on Spotify. When it comes to food, personalization palaces like Cava, Sweetgreen, and Chipotle have prevailed over the one-size-fits-all model of McDonald’s. Here, personalization comes in the form of six condiments that you can order for $1 each. Some of them are familiar, like tahina or harissa. Others less so, like zhough or chermoula. The idea is to order several of those condiments and then customize the food to fit your specific heat level and flavor palate. Sorry for the pic. This is one of the dishes I took home with me that Rose was worried about. Even after a 25-minute car ride, it was still one of the best baba ghanoushes in town. Which isn’t really surprising given the smokiness the eggplants pick up in the embers. This red pepper dip originated in Aleppo, Syria but variations abound. This well-balanced version combines the smokiness of peppers, the nuttiness of walnuts, and the sweetness of pomegranate molasses. Not bad, but probably my least favorite of the dips I tried. 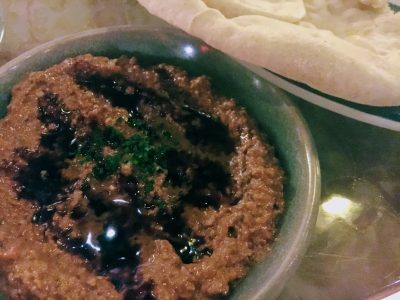 Taktouka is a Moroccan dish but eats a bit like a middle-eastern salsa, with long-cooked tomatoes, peppers and onions bolstered by cumin. 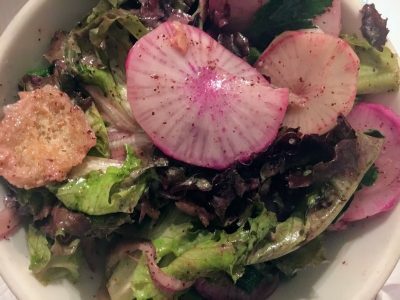 Order one or two dishes from the salad section of the menu, which tend to provide some freshness and acidity to balance out the other dishes. 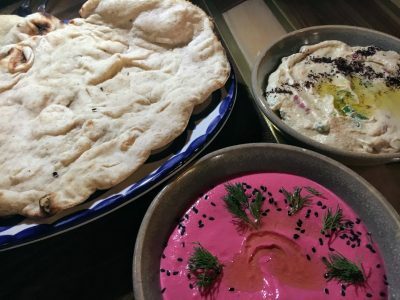 So long as you’re a radish fan, this fatoush does just that. 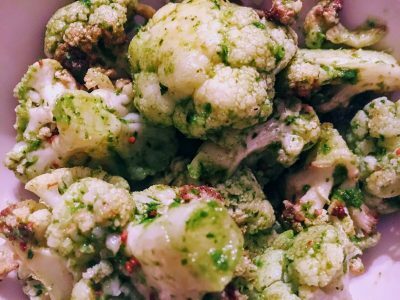 A refreshing salad-like cauliflower preparation rather than the usual roasted or fried. 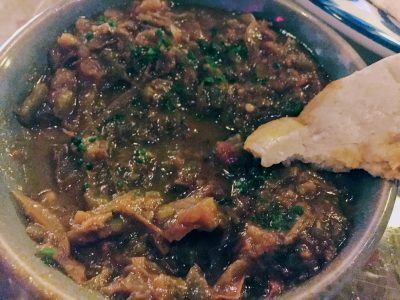 Zhough is a Yemeni green chile paste, something like a pesto with a spicier flavor profile. 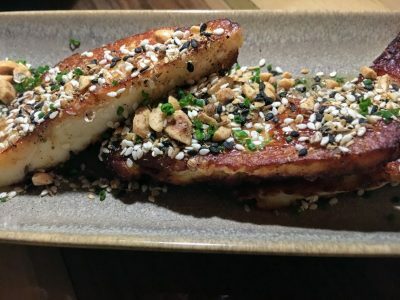 A hard sear on these halloumi slices make them extra savory — because burnt cheese is the best — which is then boosted by the nuttiness of the sesame seeds and pistachios and the sweetness from the honey. Find room on your table for an order of these. Again, the combination of smoke, nuttiness and sweetness is a winning one. 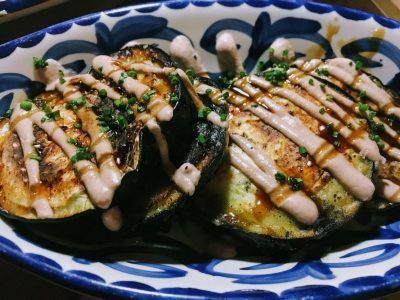 I also admire the skills of the grill cook who coaxed finicky eggplant just to the point of doneness without overcooking or using too much oil. 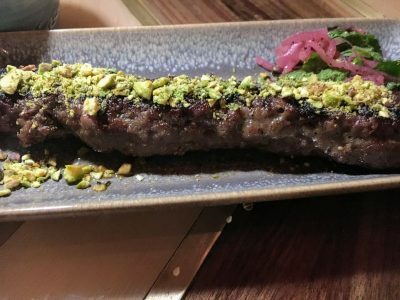 Juicy ground beef kebab laced with saffron. Lamb with pistachio. 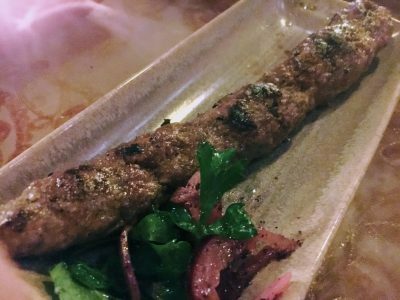 I give a slight nod to the koobideh for its juiciness and saffron-forward flavor, but the lambiness of this kebab comes close. 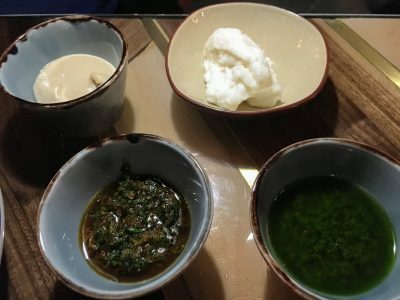 Four of the six condiments for customizing your meal. I like the fresh herbiness that the chermoula and zhough add to whatever they touch. Harissa is also available if you like more heat, as is tomato jam. 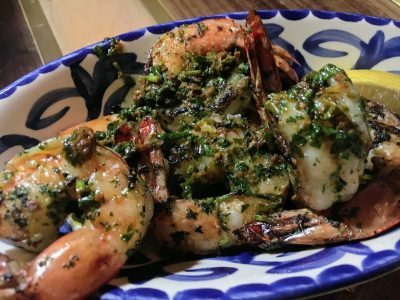 Big shrimp slathered in chermoula sauce (a North African herb sauce akin to a salsa verde). Cooking shrimp over an open flame is tricky. Grill them with their shells removed and it’s almost impossible not to overcook them. Leave the shells on or use a pan rather than direct heat and you lose some of the smoke. Maydan opts for the no-shell option. By definition, that makes them a bit tough but the smoke and the chermoula definitely help compensate. This is the chicken that reminded Said of home, roasted with sumac and other spices. For you Curb Your Enthusiasm fans, Larry and Jeff would be just as excited over this Palestinian chicken as the one in the show. I’m a dark-meat guy, but the breast meat here is moist and luscious. Eat it with the garlicky toum for full effect. Other large plates include a ribeye with blue fenugreek and a large lamb shoulder with Syrian seven spice. They’re listed under a section of the menu I call Excuses To Go Back. 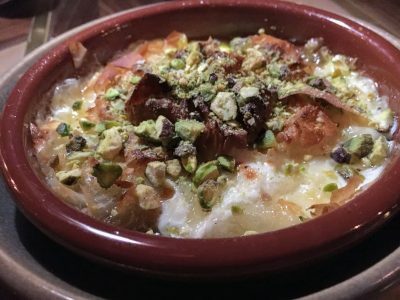 An iconic Palestinian dessert, made with a cheese pastry soaked in a sweet syrup and topped with pistachios. Good when the cheese is gooey, less so as it hardens. A little more phyllo would help. So that’s Maydan. It’s not the fanciest place in town. Or the most cutting edge. You could even nitpick the food if you wanted to. But you won’t want to, not if you’re anything like me. Because right now there’s no restaurant in town that you’ll feel as connected to or that you’ll be rooting for more. If you go, just don’t take the third seat from the left at the bar. That’s mine. Wow, Rick. I have not been to Maydan although it’s on the top of my list. Your post makes me want to drop everything and rush on over. 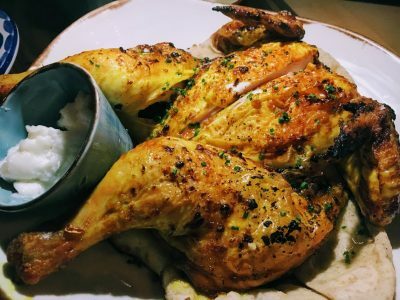 As I was reading about the chicken at the beginning of this, my mind went right to “Curb Your Enthusiasm” and the Palestinian chicken episode. And then, of course, there it was. Great writing as always! Thanks, Lori! Thought I responded but didn’t go through. I think you’ll love the whole vibe. Look forward to your report when you go! Rick – I was going to suggest you try this place — and soon — but not surprisingly you found it first. 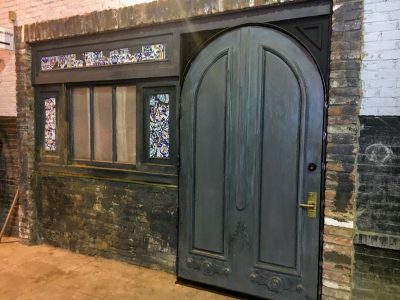 My favorite parts of the evening were the challenge of finding the front door and then the sensory overload when the door was first opened between the anteroom/hostess area and the restaurant itself. The brightness of the flaming hearth, the aromas, and the warmth were almost enough by themselves to make the experience worthwhile. The food and service were pretty great too. Can’t wait to return. Jim – totally agree about the impact of walking into the room. That was the Willy Wonka moment for me. Glad you liked it! Awesome review! I was wondering if you have to make a reservation to eat at the bar? Or just wait for a space to clear? No reservations, just walk in!